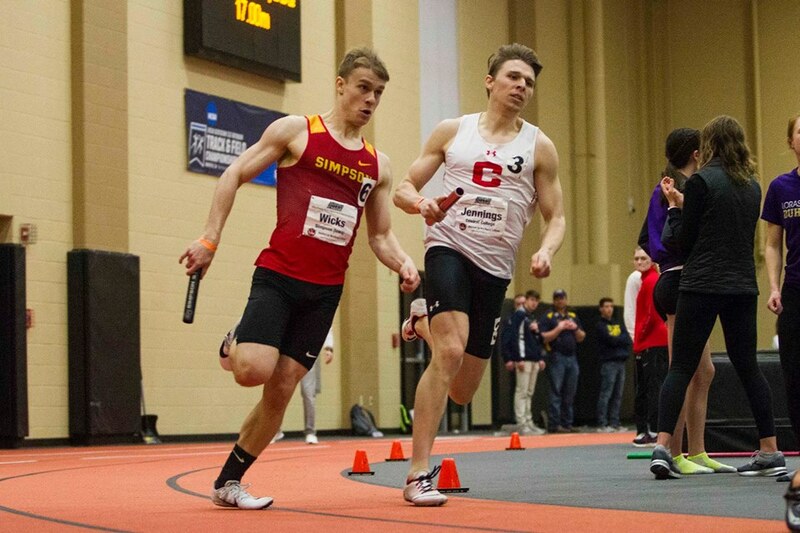 The men’s track and field team have left a legacy over the past few years at Simpson College, but they seem to be readjusting their grip on the conference during the indoor season. Producing national qualifiers such as Dylan Kalinay, along with consecutive conference titles in the 4×200-relay, are just some of the achievements the program has achieved within the last year. This year, the men’s team has been trying since December to reclaim that high mark they have set for themselves. Out of the nine schools in the American Rivers Conference, six qualified for the NCAA Indoor Championships. Simpson was left out of the pack. It is usually more difficult to qualify nationally for indoor meets than outdoor because they take less qualifiers. Regardless, the team may have felt some disappointment when things didn’t fall into place as they had in previous years. Perhaps the biggest heartbreak was the 4×200-relay team missing out on first place by half of a second at the A-R-C Championships. Head Track and Field Coach Dave Cleveland, however, is confident for the outdoor season. The team’s goal is to be competitive at a high level. Winning conference titles or getting a chance to be in the spotlight on the podium are elements of success any squad desires to accomplish. It’s tough to do that when key athletes are dealing with physical issues. Senior sprinters Emmitt Wheatley and Jordan Coughenour are both integral parts of the men’s relay teams but have dealt with lingering leg problems. Other track runners such as junior Caleb Striegel, freshman Craig Garrison and sophomore Elliott Meyer are key players in picking up the pieces. The results column will tell us the answer soon enough when Simpson heads to Pella to compete in the Central Invitational this weekend.